It was 1951. The weather had been beautiful for a week. 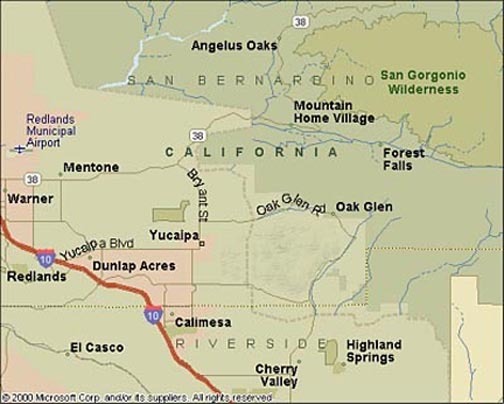 Jimmy Littrell , Arthel Price and I lived within a mile of each other in Yucaipa and were sophomores at Redlands High School. It was on the bus traveling the seven miles home from school that we made our plans to ditch school the next day. We would take the bus to school, debark, go around the campus and hike up Mentone Boulevard to the fish hatchery on Mill Creek Road where we would fish and eat our lunch. 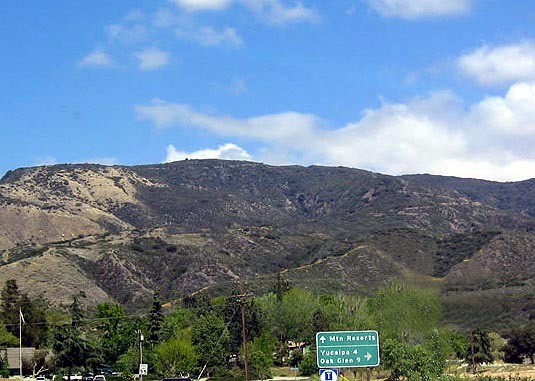 Our plan was to hike to a reservoir just past the junction of Highway 38 and Bryant, swim there and then hike Bryant to Yucaipa and on to our homes. The next day was beautiful as expected. The plan worked perfectly. 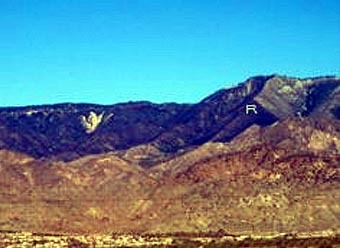 We left the bus and looked north up at Mount R where a Redlands "R" looked down at us. The R is reported as the largest collegiate letter in the U.S., standing approximately 500 feet tall and 350 feet wide. The R was designed six years after Redlands was founded, when a group of the 1916 Class freshmen hiked up the mountain to build a huge "R" to advertise the University of Redlands to the World. Thereafter all entering freshmen annually restored the "R". The university's yearbook "La Letra" is named for the "R" in Spanish as "the letter." We skirted the high school property and hiked up Mentone Boulevard and then up Mill Creek Road until the willows of the trout farm appeared just to the left of Mill Creek Road. We left the road and walked into the willows. One of us had the Salmon eggs bait and another had the small hooks on separate lines which we would use by hand or tie to a willow pole. We each caught several small trout, released them and soon tired of the sport. We sat down by the stream and ate our lunch. We hiked on up Mill Creek Road until reaching Bryant Street. We turned right on Bryant and soon left the road and went left up the sloping foothill until we reached the medium sized reservoir where we had planned to stop. We had our swim trunks under our trousers and quickly shed our clothes. The sides of the concrete walled reservoir were steep at about 45-60 degrees slope. I dove in and could not stand on the bottom. Going under, I thought it might be 10-12 feet deep. It was then that Arthel said he did not know how to swim. Jimmy and I swam around enjoying the cool water after the sweaty hike up from Redlands. We felt sorry for Arthel and were worried that he might slip down the side of the reservoir and into the water with no floatation device. We walked along the edge of the concrete until we found a 10 foot long 2X6 inch board. We carried it back to Arthel and put it in the water near him. We helped Arthel down the steep slope and got him safely onto the board. It was under his chest with his arms over the board. He was soon paddling about on his board having a good time. Jimmy and I were diving off the side of the reservoir doing various stunts and having great fun when suddenly Jimmy yelled, "Arthel's gone!" I looked over my shoulder to twenty feet away where Arthel had been floating and saw the board moving away from us and no Arthel. I swam over to where he had been and saw his light brown hair submerged about 6 inches below the surface. I reached down, grabbed his arm and pulled him up to me. Arthel immediately climbed up my body like it was a ladder and his double death grip quickly had me under water. I was in his panicked grasp and could not breathe. I felt like I was drowning. My chest was on fire and my past life was shooting rapidly through my brain. It was obvious to me that both of us were going to die unless I got loose. I was stronger than Arthel. Violently struggling, I wrenched his arms from me and pushed him away. I surfaced and sucked precious air into my lungs. I shouted to Jimmy to get a pole. Jimmy was running back and forth trying to find a way to help us. I maneuvered behind Arthel and lifted him up to get air and then pushed him toward the bank. He was reaching back trying to get a hold on my hands and arms but I kept control and continued to lift and push Arthel toward the reservoir side. Finally his feet touched the steep side and I swam with one arm while holding my left hand in the middle of his back to keep him from falling backward. Jimmy had a stick and extended it to Arthel. Arthel grabbed the stick and Jimmy pulled him high enough to grab his hand. Thanks, God, for being with us that day. A tragedy was averted. We realized how close we came to ruining the lives of three families and wrecking the school year for Redlands. Very subdued, we dressed and hiked Bryant Street to Yucaipa and on to our homes. That day was the closest I had ever come to outright dying. I thought there had been other near death experiences but the near drowning episode was definitely the worst in my 15 years. I never ditched school again!